I didn't have anything for dinner Friday night and as I have mentioned before, I have not been in the mood to experiment. But I knew I needed a few things so I stopped at Treasure Island on the way home from work with the idea that I might find inspiration for something quick and easy. I had an eggplant in my hand and the thought that I could braise it when I realized I had purchased a sweet potato the week before that needed to be used before I brought home anything new so I put the eggplant back and went home. What to do with the sweet potato? I had recently caught an episode of "Essential Pepin" on PBS where Pepin took a sweet potato, sliced it, and cooked it in a little butter, oil, and water. I took that as a springboard and got the sweet potato in the pan. 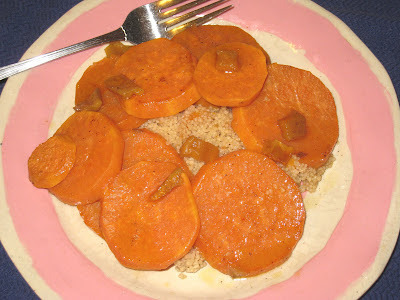 While it started to cook, I realized that I could cook up some couscous in the time that the sweet potato would cook. I had some chickpea liquid in the refrigerator that I had forgotten about so I decided to use that with the couscous. I needed something that would bring the two together and I remembered a package of dried mango that I had found at Trader Joe's months ago. I bought them because they had no added sugar, or sulfites, which most dried fruits have. I wasn't sure how they would work out. I took a few slices, chopped them, and threw half into the chickpea liquid for the couscous and held the other half to throw into the pan with the sweet potato a few minutes before it would be done. I decided to keep it simple and just seasoned with salt. The end result was more delicious than I thought it would be. The dried mango had an intensity of flavor that completed the more subtle flavor of the sweet potato slices and caramelized them, and the chickpea liquid gave the couscous a velvety smoothness that was also punctuated by the sweet, intense mango flavor. If I had thought quickly enough I would have toasted some walnuts to add texture and crunch to the dish. It was fine without it, but they would have elevated it from delicious to sublime. I will be making this again. Heat oil and butter in a large skillet over medium high heat. Add only as many sweet potato pieces as will fit in a single layer in the skillet and cook for a few minutes on each side, until they have started to brown. As they brown, move them aside and add the rest of the slices. When all of the pieces have browned, add the liquid, lower the heat, cover and cook for about 10 minutes, until the sweet potatoes are just tender. Remove the cover, add half of the dried mango, and continue to cook until the liquid evaporates. While the sweet potatoes are cooking bring combine the water and half of the mango in a one-quart saucepan and bring to a boil. Add salt and the cousous and turn the heat as low as it will go. Simmer for 2 minutes, remove from the heat, and let sit for 5 minutes. Fluff the couscous with a fork. Serve the potato over the couscous and top with the toasted walnuts. I don't believe I said that I think this is the best recipe for sweet potato, Jared. I think it's a delicious one, but I'm not out to prove anything with my recipes. I hope you like it if you do try it, Heathen. Please let me know what you think of it.